Up until the early 20s, it was not commonly known that pneumatic tyres were good for trucks. Solid rubber tyres did not ensure comfort, but they were considered relatively durable (if they worked more than a year, it was a huge success) and, moreover, costed two times less than the pneumatic tyres. Therefore, solid rubber tyres, although they were not perfect, were taken for granted by the carriers. 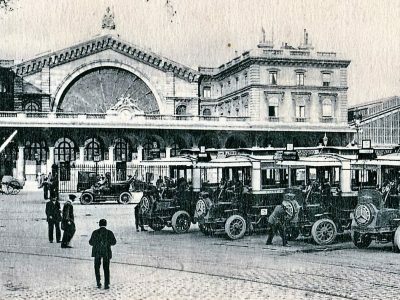 The potential of the transport market was noticed by the president of Goodyear Tire and Rubber Company Frank Seiberling. In 1902, his company launched the production of pneumatic tyres for cars, and four years later developed the first tyres for trucks. Seiberling claimed that trucks equipped with the pneumatic tyres were able to transport loads between cities. The carriers were sceptical about this invention because they saw numerous car drivers constantly repairing their rubbers on the roads. They were convinced that trucks using solid rubber tyres are limited to the city traffic. In 1916, the company sold nearly 126 thousand solid rubber tyres and only 2141 pneumatic tyres. Even light trucks, such as Ford TT, had solid rubber tyres on their rear axles, because they were more durable than pneumatic tyres and allowed to transport heavier loads. 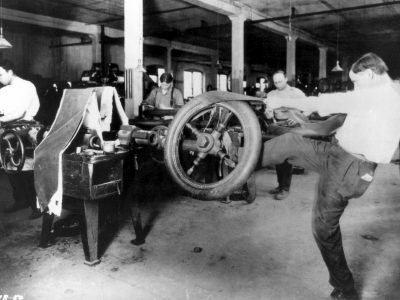 To promote truck tyres, Frank Seiberling decided to organize a road trip from Akron, Ohio, to the factory of cotton cord in Boston, Massachusetts. One way the trucks were to transport ready tyres, and back they were supposed to bring the cord, the distance was 2500 kilometres. 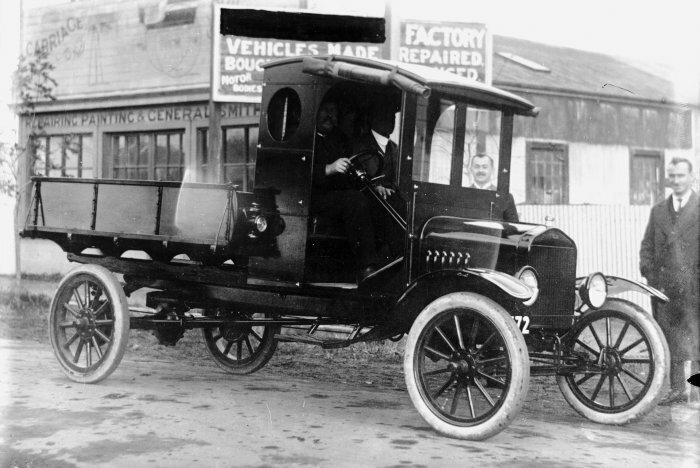 The company bought the Packard E truck chassis and ordered an oak closed body specially designed for it. The truck was driven by two daredevils, and the hold was full of blocks, spare tyres, fuel, grease and water. The vehicle hit the road on 9 April 1917. 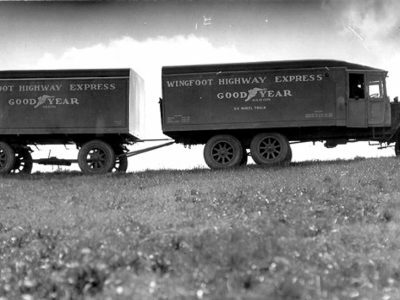 The truck gracefully called “Wingfoot Express” had even a bed behind the driver and passenger seats: a prototype of the sleeping compartment. The vehicle got stuck in the mud at the fortieth kilometre. The drivers trapped in the cabin spent there the whole night. But then it was better. Packard entered the Lincoln Road (built since 1912 and promoted by, among others, Goodyear), which was covered with compacted gravel. Every place we stopped we attracted a crowd. People would come around, kick the tyres and want to know if they were solid or pumped up. Although we had to change rubbers very often, using solid rubber tyres was impossible because the vehicle would have smashed into pieces,” said Harry Smeltzer, one of the drivers. After 19 days, Packard got to Boston. There, for three days, the drivers rested and restored the truck to its original condition. In one day they got to the cord factory in Killingly, Connecticut. They loaded the cotton cord and in five days they were back in Akron. Smeltzer joked that the whole trip took 28 days and 28 tyres. 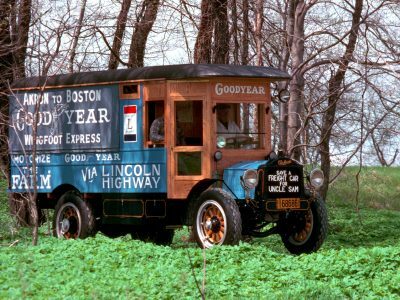 The truck got a flat tyre every 120 km on average, it broke the drive axles, the engine had to be repaired two times, but Goodyear proved that long-haul road transport is possible.